Sponsors of the backpack campaign present check to God's Pantry Food Bank. 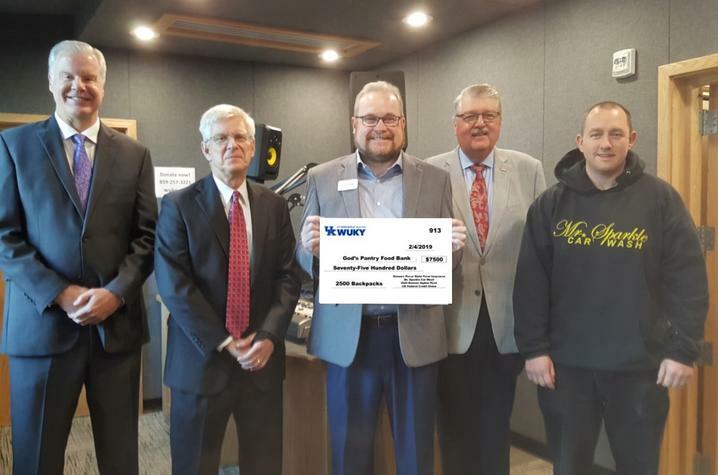 From left, David Kennedy, UK Credit Union; Perry Bentley, Stoll Keenon Ogden; Michael Halligan, God’s Pantry; Stewart Perry, State Farm; and Forrest Turner, Mr. Sparkle Car Wash.
LEXINGTON, Ky. (Feb. 8, 2019) — WUKY’s year-end fundraising partnership with God’s Pantry Food Bank, along with sponsors Stewart Perry of State Farm Insurance, Stoll Keenon Ogden PLLC, Mr. Sparkle Car Wash and UK Federal Credit Union, was a huge success and great way to end 2018. Thanks to WUKY's sponsors, God’s Pantry was able to fill 2,500 backpacks with food and deliver to children in need. WUKY also set a record for year-end gifts from listeners and supporters. For the past several years, WUKY has partnered with God’s Pantry Food Bank to raise awareness of the backpack program. Stewart Perry of State Farm Insurance, Stoll Keenon Ogden PLLC, Mr. Sparkle Car Wash and UK Federal Credit Union sponsored the December 2018 campaign to help fight child hunger. For every donation made to WUKY through the month of December, the sponsors filled a backpack for a child in need. The 2,500 backpacks represented a 1,000 backpack increase from the December 2017 fundraiser. According to Feed America's Mapping the Meal Gap, the child food insecurity rate in Fayette County is 17.1 percent — 10,490 children. God’s Pantry Food Bank distributes up to 860 bags of food weekly. Each bag contains seven to 10 kid-friendly items of food such as a protein-rich main dish (macaroni and cheese or chicken and rice), shelf-stable milk, fruit cups, granola bars and other items chosen by a registered dietitian. WUKY, an NPR station, is a community-supported service of the University of Kentucky, with historical roots spanning over 78 years.